In the slow coldness of winter, I’ve been thinking about warmth and movement and a little sun-warmed magic. It brings to mind a special place in Idaho known as Crystal Mountain - a giant formation of pinkish quartz crystals jutting out from the high desert landscape. The air there in the summertime is hot and dry and filled with the aromatics of the resinous plants that grace the slopes - ponderosa, sagebrush, and my personal favorite: ceanothus. I crave those smells in the dead of winter and my body longs for that heat and the buzzing energy of the summer air. Perhaps I am even more prone to crave that warming energy, as I’m just about as cold-blooded as they come. Do you ever think about the flow of your own body - both the way your body physically feels and how you react to the world around you? Perhaps you’ve noticed that you tend to react quickly and angrily, or that you struggle with hot inflammation or flushed skin. These signs (both emotional and physical) can tell you a lot about your constitution and guide you on a way to work with your body and self in more productive ways. Take a few moments and think about your own constitution. Think about the way that you respond to stress, the foods that make you feel the best, how your own body feels. If you are so inclined, you might consider taking a simple quiz about your constitution online to provide a few more insights. Your constitution may change seasonally or at different points in your life - shifts are normal. There’s nothing wrong with any combination of traits or factors; it’s just about finding your balance and doing things that support the way you are instead of fighting against it. Think, for example, of the comfort a hot dry sauna brings when one is feeling chilled and heavy and damp (but how that same sauna would be equally unpleasant in the midst of a hot sweaty summer day.) The more you get to know yourself and your body, the better you will be at knowing what you need. Now, let’s talk about coldness and slowness. Sometimes, we just feel stuck. Our bodies feel heavy or like they are under pressure. We struggle to keep warm or make our own body heat. We seem to catch every cold we come across, and they just seem to linger. Someone with any constitution may feel this way from time-to-time (think of the chilled-to-the bone feeling you may get after hours in the cold winter air), but for others this feeling may be perpetual and chronic. We may feel melancholy, introverted, stagnant, or sluggish in addition to cold or damp. Wonderfully, there are ways to address these feelings, and one of my favorite plants for the job is Ceanothus (also known as Red Root, Desert Lilac, or Mountain Lilac.) Ceanothus is a beautiful herb that nobody seems to be talking about. This puzzles me, as its pleasant spicy scent, healing properties, and proliferation all over the country make it an ideal herb. No other smell captures the feeling of “home” quite so much for me. When my heart aches for the Idaho high desert I grew up in, I reach for this plant before all else. Not all species are fragrant and spicy, but the variety found in the Rockies where I live (Ceanothus velutinus) has an extremely pleasant scent in both flowers and leaves. (By the way, it is thought that the more aromatic species generally have stronger properties, but all ceanothus varieties can be used more-or-less interchangeably.) Its energetics are warm and dry, and it is known to be a gentle but effective herb for many ailments relating to slowness and coldness. It is most appropriate to use for lingering chronic conditions as opposed to hot inflamed ones. Think of slow-healing wounds, feelings of heaviness, mononucleosis, secondary infections like bronchitis, enlarged lymph nodes, sluggish digestion, dull skin, or autoimmune conditions. It is also just a lovely herb to make that heavy cold feeling dissipate. Ceanothus clears the body of stagnancy, whether in the blood, digestive system, or lymphatic system. It is particularly well known to stimulate movement in the lymph nodes all over our body and has a particular association with the spleen. When lymph nodes are congested or hardened, it helps move that stagnancy out and makes the body feel lighter. Most of these benefits are more pronounced when taking it regularly as a medicine (usually in the form of a tincture - you can learn more and make your own here and always be sure to consult your doctor first), but I think it is interesting to know the ways an herb reacts with your body in general. It’s also known to be particularly helpful in cases of nagging pelvic weight, pain, and pressure. If you carry a heaviness in your pelvic area, perhaps some bloating or swelling, ceanothus could be a helpful plant for you. It’s often used as a constitutional tonic for pelvic pain (especially during the menses) and even ovarian cysts. It’s important to note that it’s not a cure, but may bring relief while foundational causes are being addressed. I’ve also provided a little self-care ritual for a Lymph-Moving Shower to help get your fluids moving and move that stagnancy out! 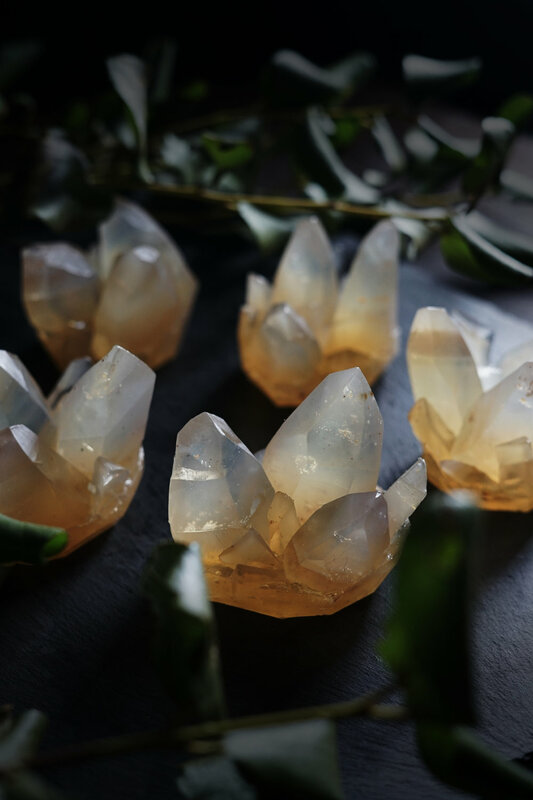 Quartz crystals, what a perfect symbol of movement and warmth! 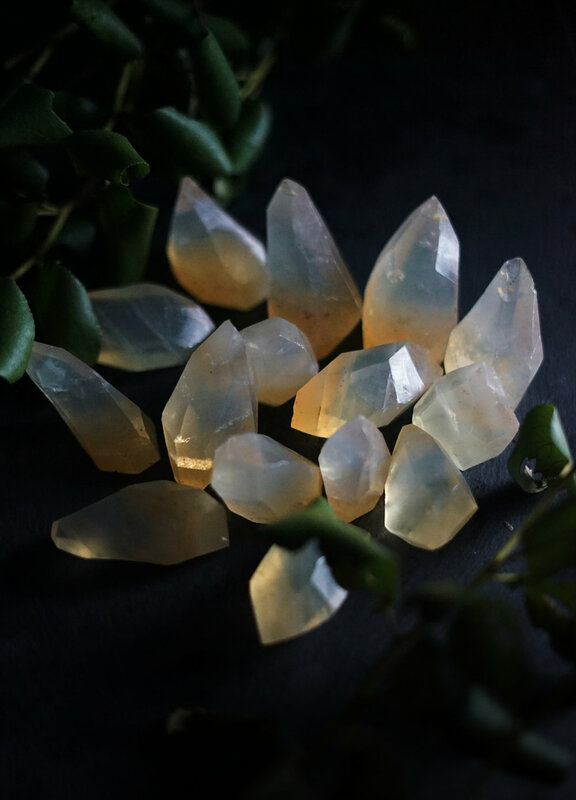 I have distinct memories of knocking two chunks of quartz crystal together in the dark as a child and admiring both the sudden shocks of light and the strange ozone-smell this action caused. Little did I know then that there’s actually a name for this phenomenon: the “piezoelectric effect.” It is what makes quartz crystals such a dependable battery. If you squeeze a crystal of quartz in the right manner, it generates a tiny electric current. The pressure on the crystal’s surface forces ions within it to move, which upsets the overall balance and turns the crystal into a tiny battery with oppositely-charged faces. There’s a reason quartz crystal watches are the height of fashion and luxury. 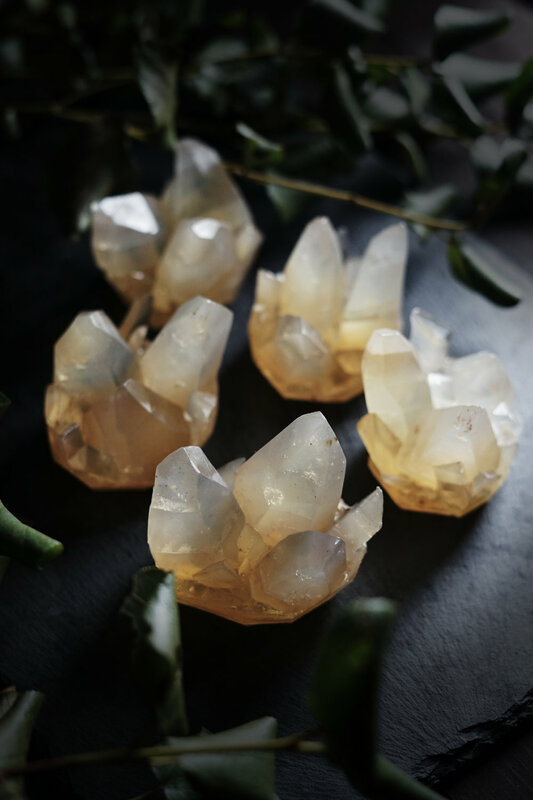 The word “crystal” itself speaks of magic; it comes from the Greek word for ice, as it was believed that clear quartz was water that had frozen so deeply that it would always remain solid. Many civilizations have been entranced by the inherent magic of quartz crystals. The first historical reference to the use of crystals comes from the ancient Sumerians, who used crystals in magic healing formulas. 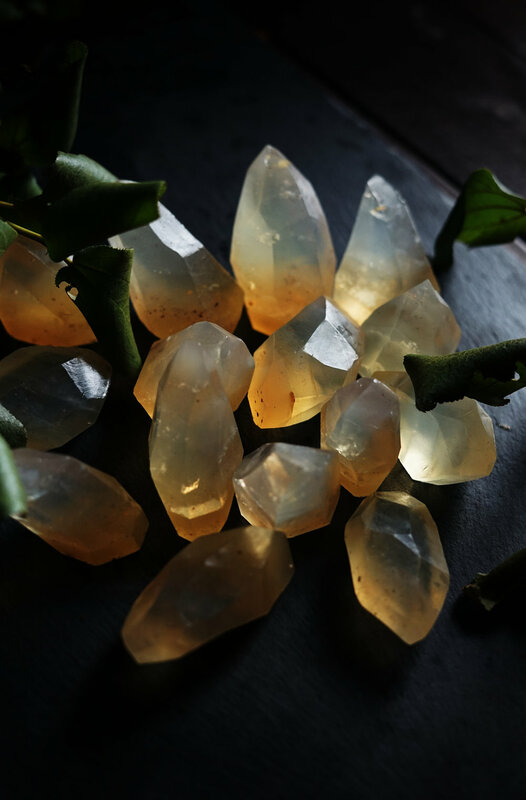 This trend spread throughout the ancient world and throughout many religions (you can find references to crystals in many different religious texts, from the Bible to the Koran.) During the Renaissance the tradition of using precious stones in healing was common. Today, we understand that all things in the universe are forms of energy with their own frequency and vibration. Some believe that this vibrational energy holds a kind of healing magic within it, a way to tap into other states of consciousness. Whether you believe that or not, I think you can agree that the formation and beauty of these rocks is inspiring. And easy-to-use glycerin soap is a wonderful medium to pay homage to them with! This soap is reminiscent of the peachy color of the crystals from crystal mountains. Inclusions such as luster powder and grated nutmeg give it a great sense of realism, and I have chosen warming scents to pair with the other nourishing ingredients to make a soap that is as soothing as it is beautiful. To make it, you’ll need to purchase a clear melt-and-pour soap base, which can easily be found in most craft stores, herbal stores, or online. This is soap that’s already gone through the reaction of saponification and is much easier for beginners to work with since you don’t need to handle caustic lye, which requires safety equipment such as gloves, respirator, goggles, and dedicated soap-making containers. Melt-and-pour glycerine is safe to work with in your kitchen, even with kids - just make sure the soap isn't too hot if they are handling it. To make ceanothus-infused oil: Just harvest ceanothus leaves and allow them to dry, then fill a clean and dry jar about 1/2 to 3/4 full. Top with organic extra virgin olive oil and leave somewhere dark and dry for 4-6 weeks, then strain. If you’re pressed for time, you can also make a warm infusion. Heat a pan of water over low heat and place the oil-filled jar inside. The water should come up about halfway on the outside of the jar. Let simmer for a few hours, then shut the heat off and let it infuse overnight. Strain the next day and use as directed. Cut the clear glycerin soap into cubes, then divide equally into 4 microwave-safe glass measuring cups or containers and cover each with plastic wrap. Dissolve the goat’s milk powder into the hot water, then strain through a strainer into a small bowl to remove any lumps. Meanwhile, melt the soaps in the microwave at 50% power, stirring every couple of minutes until most of the soap has melted. Remove from heat and let sit (covered) until the rest of the soap has melted. Once all of the soap has melted, stir the additions into the mixtures as followed: Mixture 1: stir the milk mixture into one of the containers of soap, along with cardamom essential oil. Mixture 2: Stir in bergamot essential oil and powdered nutmeg. Mixture 3: helichrysum essential oil and the clay. Mixture 4: bergamot essential oil and 1/2 tsp. ceanothus oil. Place a coin, chopstick, or other small item under one corner of the mold so that it is a little uneven. Pour a small amount of mixture 1 in the mold, then spray the top with rubbing alcohol and sprinkle with a bit of the gold mica powder. Let a thin skin form on top of the soap, then spray the surface of the soap with rubbing alcohol. Remove the item and place another item of a slightly larger size under the opposite corner. Pour a small amount of Mixture 2 into the mold, spray the top with rubbing alcohol and sprinkle with mica. Repeat the process, using up all of the various mixtures until the mold is filled. It’s best to pour in the order of 1-2-3-4-3-2-1. Don’t forget to sprinkle the gold mica powder in between layers to give a speckled look! You can reheat the soap in the measuring cups for 10 second intervals as needed to keep them liquid. Allow the soap to cool and fully harden, then remove from the mold. Cut the soap log into slices at an angle, then use a sharp knife to carve each piece into a crystal shape. Note: If you want to make your soaps into a cluster of crystals, fill oval soap molds with some of the scraps leftover. Then, melt a small amount of leftover soap and pour it into each mold. While it’s still warm, stick the carved crystals in along with any other scraps you want poking out of the tip. Let harden, then remove from mold. First, get out and move your body. Since the lymph system doesn’t have a built-in pump (like the circulatory system does with the heart), it’s important to get things pumping and moving to help built-up fluids move the way they are supposed to. Walking is the ideal way to do this - the way our bodies are designed allows the lymph nodes to be activated as we perform the movements necessary to walking. It doesn’t have to be a long walk, nor a physically exerting one. Just go at a comfortable pace for a comfortable distance. Next, dry brush your body. Using a soft dry brush stimulates lymphatic movement and helps the fluids flow throughout your body. Before you begin, you might consider taking a moment to make your space extra relaxing - putting on some nice music or lighting some candles. Then undress, and gently brush the skin of your whole body in the direction of your heart. When you’ve finished dry brushing your body, hop in the shower. Start with it at a comfortable warm temperature, but then alternate between hot and cold (or warm and cool if you are particularly sensitive to temperature changes or have blood pressure abnormalities.) Cold makes things constrict, while hot relaxes. The back-and-forth of the two gets your lymphs flowing and un-stuck. Alternate between the two at least 6 or 7 times, then turn the water temperature back to a normal comfortable temperature. Cleanse your body as you normally would, using your soap of choice. Pay special attention to your lymph nodes (underneath your armpits, between your legs, and at the top of your throat.) These are likely places you’d be cleansing anyways, as they are often the areas that collect the most odor and sweat. Once you’ve finished your shower, hop out and dry off, then put on some comfortable clothes. Now comes the rest and emotional component of this ritual. Grab a big glass of water or cup of herbal tea - in order to keep your lymphatic fluids moving properly, you need to be well hydrated - and settle in. Think about the things in your life that you might be holding onto and need to release. These may be emotions or circumstances or even relationships. Write them down, paying attention to the physical sensations you feel in your body as you think about these things. When you’ve finished, release the written paper in whatever way feels best to you (I usually burn it in a safe location) and think of a few things you are grateful for to shift your brain chemistry to more positive things. The ritual is complete once you feel like your body is lighter and the stagnancy has shifted. You may need to revisit different portions if you aren’t feeling a shift, or be patient with yourself. Sometimes it takes us a little time to really get things moving.